It was, I recall, one of only two days a year the mill shut down. hidden somewhere, which explained the frenzied jocularity. and rehab the land, make it like all of it—none of it—was ever there. the water and yell, Hey salmon, it’s your turn again, good luck! that’s the simple why of the world—much wants more, every time. I was speaking to my father last year on Labour Day (note the British spelling) and about how it had been a very special day in my little town of Grand Falls, Newfoundland, Canada when I was growing up. The local industry was a newsprint factory (the paper for the New York Times was, for example, made exclusively there) and the right to form unions had been a long, bitter and necessary battle to fight and win. 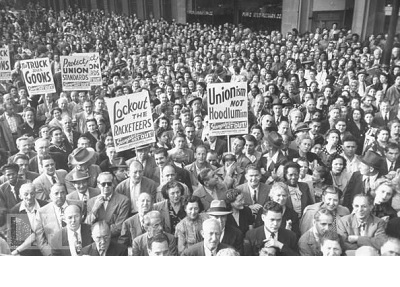 Men were proud of their unions and proud of the prosperity it had bought. And now? In the modern world, management has won. Labour Day is just an end of summer vacation day where the name, the rights and the history of it are no longer appreciated. My point is not to comment on the status of modern labor rights, but to lament the loss with the past, however good and bad it was. Thank you for reading Labour Day. I humbly appreciate your visiting the Book of Pain, and as always, I look forward to your comments. Photograph in the public domain; notes and poem © John Etheridge; all rights reserved. The poem and accompanying notes are licensed under the Creative Commons Attribution-Noncommercial-No Derivative Works 3.0 Unported License. This applies to all original written work found on this site, unless noted otherwise. The attribution claimed under the license is: © John Etheridge, https://bookofpain.wordpress.com. The photograph is not licensed for use in any way without the expressed consent of its copyright owner. “Much wants more” memorable concept and poem, John. Very straight-forward perspective of a time gone by! Wonderful! Had the unions gave a little I think the mill would stil be going or at least it would have for a few more years but that is all guessing as almost all paper mills in canada have shut down. I am glad i had the chance to grow up in my school years in grand Falls in the 40s 50s best of all good worlds. It is a complicated issue. The demand for papers surely has decreased since the Internet, the cost of getting to the wood stands and the quality of the trees was another. (My uncle is a Forest Manager and had campaigned for years on the necessity of letting fires naturally cull the forests, improve the soil and create new generations of healthy forests.) And yes, the unions too. In the end, I am not sure what was the most demanding issue…perhaps it was a combination of everyone’s expectations being high. But you say you grew up in Grand Falls? Do we know each other? Or did you know my parents or my sister? Are you still there in Newfoundland? ‘Much wants more’ That rings so true, here, there and everywhere . A wonderful piece John. You’re not the only one who remembers. I still miss the sound of the Drum Barkers. When they first quieted, I couldn’t get to sleep and couldn’t figure out why. Then it hit me. They’re rumbling song was over and would sing me to sleep no more. OMG you are so right! I had forgot that! I’ll write directly as soon as I can. PS: what was misspelled?! Nouht thut i wuold notise! !